PRINCE FREDERICK’S BARGE was a purpose built state barge based upon the form of a Thames Wherry with a raking stem, flared bow and broad beam, enabling her use as a royal water-taxi. However her length is less traditional, being over 63 feet and giving space for 21 oarsmen forward of the cabin. The hull is of oak clinker construction with copper fastenings. The oars become shorter in length towards the stern as to ensure uniform distribution of thrust when being rowed and are visibly numbered to ensure correct location. The oars sit within leather oar beds and are weighted with lead for balancing at the waterline when not in use. An ornate cabin is situated towards the stern of PRINCE FREDERICK’S BARGE with central gangboards allowing access from the bow; these gangboards were moveable for when rowers were in situ. 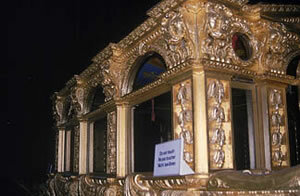 Decorative baroque style wooden carvings gilded with 24 carat gold leaf can be seen along her length including flowers and wave patterns plus Corinthian columns comprising the cabin. 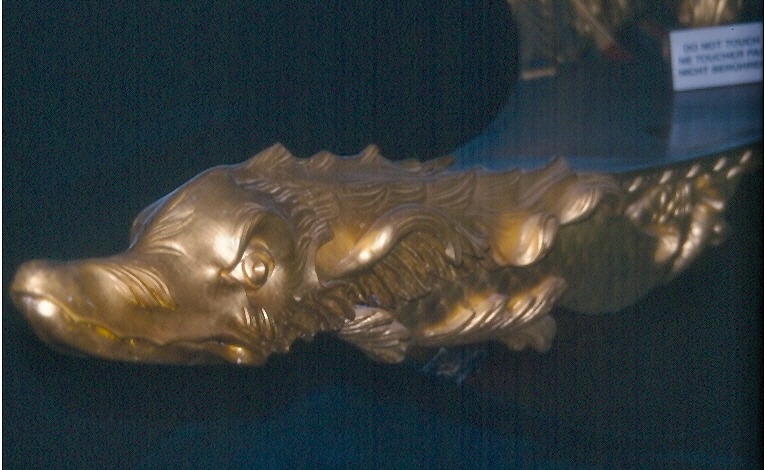 Carved decoration towards the stern includes a mermaid and dolphin on each quarter with the stern emblem being the garter star below the Prince of Wale’s feathers. The cabin roof is canvas painted with oils as to be watertight; a crown was added on top at a later date. 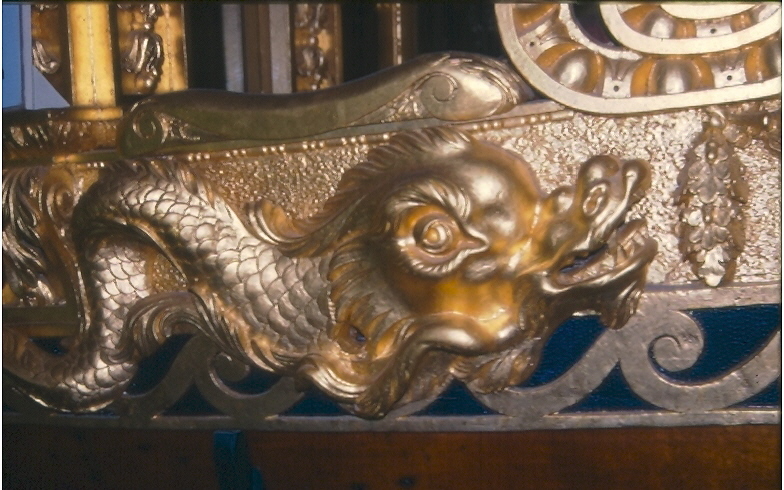 Inside the cabin are gilt carvings and seating upholstered with velvet and silk damask. 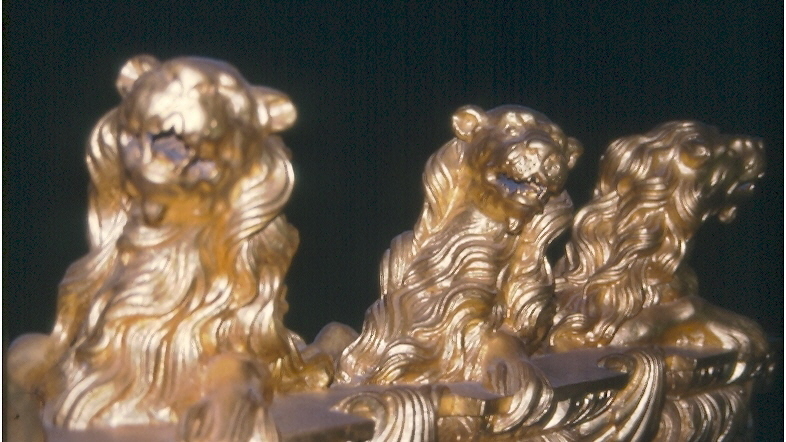 Heraldic lions and other royal symbols can be seen in decoration. The hull, keel, oars, cabin and interior fittings including upholstery are all original. There have been a few repairs in the hull planks of PRINCE FREDERICK’S BARGE and the replacement of one cabin window. Her carvings were re-gilded in the 1970s while at the National Maritime Museum in Greenwich, however much has since been worn away while on display to the public. Pictorial evidence indicates that one part of the scallop carving at the stern was also replaced during the 1970s. Cracks can be seen in carvings at the stern which are believed to have formed as they have dried out. 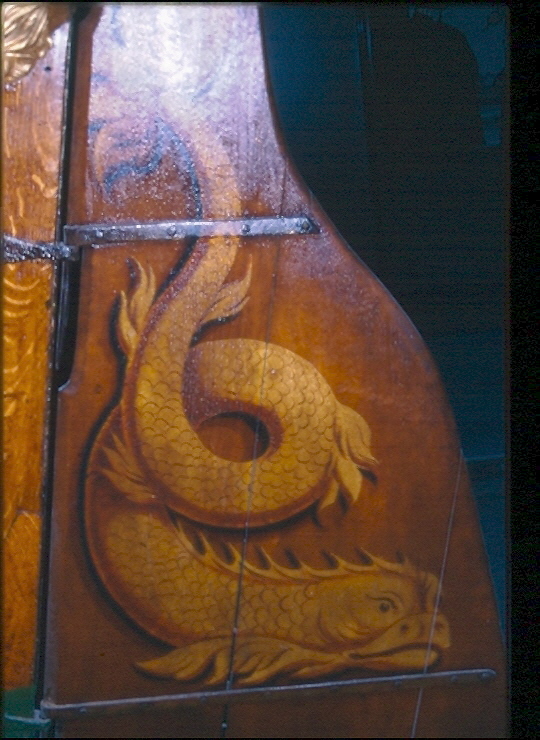 The paintwork of PRINCE FREDERICK’S BARGE from the late 18th century remains, however it would have been retouched during her working life as well as during the 1970s while at the National Maritime Museum. A museum acquisition number can be seen on her rudder, with a second rudder situated in museum storage. It is generally believed that the hull of PRINCE FREDERICK’S BARGE was broken into three sections to enable storage at the Royal Barge House at Windsor Great Park after 1849. This is contested due to lack of visual evidence of such a significant change in form; however photographs do show some longitudinal distortions of the hull just forward of the cabin. PRINCE FREDERICK’S BARGE was built in 1731-32 for Frederick, Prince of Wales, as an expression of his patronage of the arts. It was designed by architect William Kent and built by shipwright John Hall opposite Whitehall in London. Many of the carved motifs employed by William Kent for the barge are echoed in his other architectural designs including Chiswick House and two of Kent’s original plans for the barge are kept at the Royal Institute of British Architects. 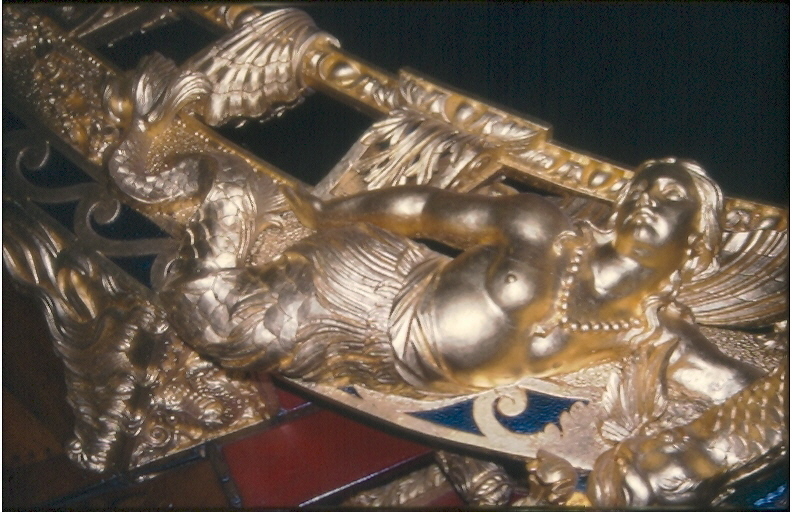 The carvings on PRINCE FREDERICK’S BARGE were done by James Richards who was, at the time, Master Carver to the Crown; gilded work was done by Paul Petit. PRINCE FREDERICK’S BARGE was used as a state barge for over 115 years, travelling between royal residences and on the Thames upstream towards Hampton Court and downstream as far as Woolwich. She was used as part of a flotilla and often for journeys involving or celebrating the arts; her first outing was to take the Royal party to inspect the progress of the royal paintings at Somerset House. It is also known that she was used during a regatta in Woolwich in with additional Chinese-style decoration. A painting by Constable from around 1819 is believed to show PRINCE FREDERICK’S BARGE at the steps of Whitehall. Constable is known for working outside and from real places – this painting shows the barge at an event of ceremony and splendour and of great enough significance to commemorate on canvas years after the event. After Prince Fredericks’s death, succeeding monarchs continued to use PRINCE FREDERICK’S BARGE as the primary state barge, including Kings George II, III and IV. Her last outing was made on 30 October 1849 by Prince Albert at the opening of the Coal Exchange after which she was stored at the Royal Barge House at Windsor Great Park. PRINCE FREDERICK’S BARGE was loaned to the National Maritime Museum by King George VI in 1951. She is on the National Register of Historic Vessels and is a member of the National Historic Fleet. PRINCE FREDERICK’S BARGE is one of the most impressive state barges in existence both in terms of decoration and originality. It is this plus her rarity, age and association with the Crown which means she has great national significance. 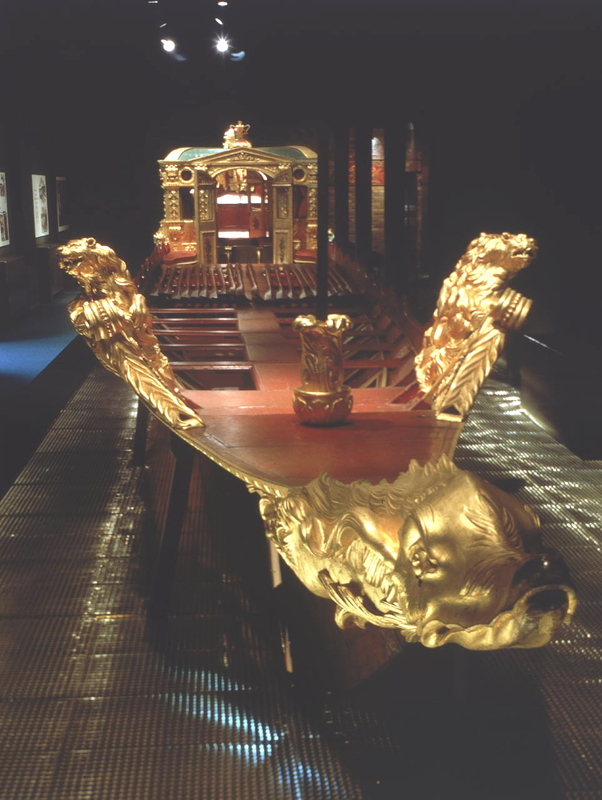 PRINCE FREDERICK’S BARGE was used as a grand ceremonial barge to transport royalty for ceremonies and festivities. She is sumptuous yet elegant in appearance, with magnificently gilded carved decoration along her length and particularly at the stern and cabin. This, plus the splendid fittings and decoration of the interior of the cabin and use of quality materials including silk and gold, were all in order to impress. Her shape and proportions, moving from hollow at the bow to more convex at the stern, plus light construction enabled her to act as a water-taxi – being fast and stable. This would have also enabled her to be easily beached and re-floated, allowing royal passengers to disembark straight onto the shore and stay dry. PRINCE FREDERICK’S BARGE is now kept on static display at the National Maritime Museum, Greenwich. The wherry-type dimensions and carvings of PRINCE FREDERICK’S BARGE were used to inform the design of royal rowbarge GLORIANA, launched in 2012 and the first royal barge to be built for over 250 years. This means that traditional structures, techniques and legacy of the state barge continue into the present day. This barge was launched in 1732 for George II's and Queen Caroline's eldest son, Frederick Prince of Wales, who used her until his death in 1751. Thereafter she was used as a royal barge by succeeding monarchs until 1849. William Kent (1685-1748), the architect commissioned to design it, also worked on the interior decoration of Lord Burlington's villa at Chiswick. Many of the designs and architectural motifs which he used at Chiswick are repeated and adapted for the Barge which he designed in 1730, the year after Chiswick House was finished. John Hall, who worked on the south side of the Thames facing Whitehall, built her. James Richards, who succeeded Grinling Gibbons in 1721 as Master Carver to the Crown, was employed to interpret Kent's drawings. Paul Petit gilded the carvings and Paul de Lamerie, the Huguenot silversmith, provided silver badges to be worn on the watermen's right chests. Kent also designed the watermen’s costumes. The barge was used 'the first day it was upon the water' to take Prince Frederick, his mother, Queen Caroline, and the five princesses from Chelsea Hospital down to Old Somerset House to see 'Mr. Walton's progress in cleaning and mending the Royal Pictures. Since Handel stayed at Burlington House while Kent was living there, it is likely that a version of his Water Music was played on this occasion, although it was not published until a few years later. From the accounts, it is known that two cushions were provided for French horns. On one other occasion, it attended a regatta at Woolwich in 1749 decorated in the Chinese manner, with the oarsmen in Chinese costume. After Prince Frederick's death in 1751, the barge was used by successive kings and queens as the principal royal barge and the Prince's crown on the rod was replaced by a Sovereign’s crown. The last time PRINCE FREDERICK'S BARGE was used was at the opening of the Coal Exchange on 30 October 1849. Queen Victoria was unwell at Windsor, but Prince Albert, with the Prince of Wales and Princess Royal, embarked at Whitehall Stairs soon after noon. The barge, which had been newly-gilt for the occasion was steered by the young Captain Lord Adolphus Fitz Clarence. From 1849 to 1951, the barge was stored in the Royal Barge House in Windsor Great Park, at which time the late King George VI placed it on loan to the National Maritime Museum (from 1951). Unfortunately to save on storage space, she had been cut into three sections. Consequently a great deal of conservation was required but it is now on display in the Museum.